WHERE'S SPOTS? Young boy Atari Kobayashi (voiced by Koyu Rankin, center) travels to Trash Island to find his beloved Spots and receives help from some of the other dogs banished there. Glen I find stop-motion animation incredibly charming. By today's standards of computer-generated animation, it's decidedly quaint, but it reminds me of my childhood love for Ray Harryhausen's work in films like Jason and the Argonauts and Clash of the Titans. Recent films like the claymation Wallace and Gromit films A Grand Day Out and The Wrong Trousers or Tim Burton films like The Nightmare Before Christmas and Corpse Bride—and let's not forget Charlie Kaufman's Anomalisa—are simply amazing. There's something whimsical and wonderful about the technique, and for an inherently quirky director like Anderson, stop-motion allows him to fully divest from reality. Talking dogs feels completely natural in Isle of Dogs, which explores the unique relationships between humans and dogs from the dogs' perspective. Chief, for instance, is a stray, and his pack members subtly and silently judge him for it. Nutmeg is a former show dog used to regular grooming and being fawned over, but like all the other dogs banished to Trash Island, she lost her elevated position and deals with it with a level of class that's hard not to admire. This sort of anthropomorphization is human nature—we love to imagine that our pets have an inner dialogue and love us the same way we love them. Anderson has a lot of fun exploring how dogs think of humans and each other. Ultimately, this is a film about relationships, loyalty, honor, and ethics, which are pretty heavy topics. But first and foremost, this is a wonderful looking film. I absolutely loved it! Anna It's an incredibly charming film, as most of Anderson's films are. It has his signature feel, and if you're already a fan of the filmmaker, Isle of Dogs will undoubtedly satisfy with the same talented cast and clever storytelling Anderson brings time and time again. I too am a big fan of stop-motion animation, and while I tend to like animation in general a bit more than Glen, this style takes the cake. The detail work is genius, the almost tactile feel of the film is super engaging. Puffs of what looks like the inside of a pillow creating clouds of dust as dogs fight, the scrappy rats that scurry in the trash heaps, Atari's bruised but determined soft face—it all creates such a wonderful feast for the senses. The main pack of dogs is hilarious: Chief's tough stray exterior, Duke the rumor monger, Rex's insistence on a voting system within the pack, and Murray as Boss pulling off great one-liners as usual. This group of actors clearly likes working with Anderson as they continue to do so time and time again, and the audience reaps the benefit of their close-knit cast work. Glen It really is a great cast doing great voice work with some fun surprises. Courtney B. Vance's smooth voice as the narrator provides necessary context, John Lennon's former wife Yoko Ono makes a vocal appearance as Assistant-Scientist Yoko Ono, and longtime Anderson collaborator Anjelica Huston is credited as voicing a character named Mute Poodle, meaning she has no lines. Greta Gerwig is terrific as earnest and idealistic exchange student Tracy Walker. While the dogs all speak English, all the Japanese characters speak in Japanese, so we have Frances McDormand starring as Interpreter Nelson. You'll also hear the familiar voices of Harvey Keitel and F. Murray Abraham. Tilda Swinton is great as Oracle, a Pug who watches TV and repeats what she sees, leading the dogs around her to think she's a prognosticating mystic. Even though the story centers on Atari and his search for Spots, this is really Chief's story. He's the character with the biggest arc, the one who has to learn about the sacred relationship between man and dog, who also has to learn he's good enough to deserve a mate like Nutmeg. The dogs are actually a lot more complex than most of the human characters, and it's Chief we're rooting for more than Atari. The models, sets, and animation are so compelling that I felt fully immersed in the world Anderson and his team of filmmakers created. I know Anderson's sensibilities don't appeal to everyone. 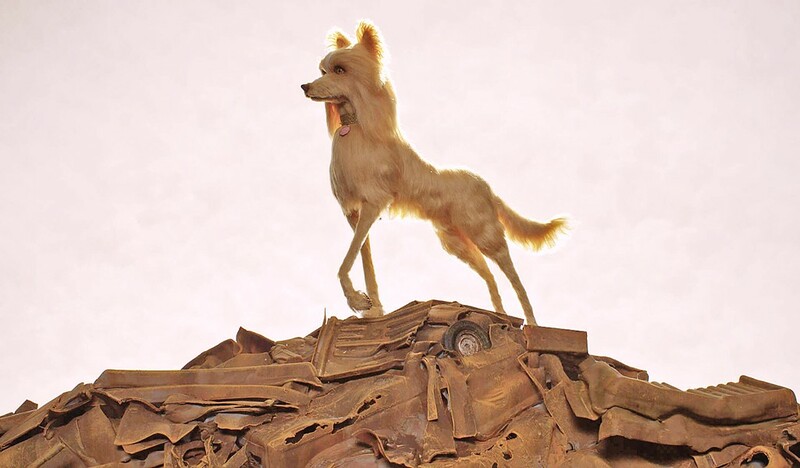 His droll humor doesn't resonate for some, but if you've liked his previous films, you'll find Isle of Dogs a worthy entry into Anderson's oeuvre. SHOW DOG Nutmeg (voiced by Scarlett Johansson) encourages the reluctant dogs of Trash Island to help a little boy find his beloved pet.